After sitting out all of the 2010-2011 season with his second torn ACL, Robbie Hummel has returned for his fifth season at Purdue, where he finds himself playing for the first time without classmates JaJuan Johnson and E'Twaun Moore, both of whom are now playing in the NBA. Their departures have thrust Hummel into a larger role offensively, which so far he's handled with mixed results. The 6'8 face-up power forward has changed his body quite a bit since arriving at Purdue with a skinny, under-developed frame back in 2007. While his stronger, bulkier upper body helps him compete with opposing Big Ten big men, he has noticeably lost some of his mobility and quickness, which may change the way scouts envision him potentially fitting in at the NBA level. Perhaps Hummel's biggest asset as an NBA prospect is his ability to shoot the ball from the perimeter. Playing the four spot at Purdue, he's able to draw opposing big men away from the basket and get many of his looks spotting up. He's shooting a solid 39% from 3-point range so far this season, fairly consistent with his previous years. This is impressive considering his increase in attempts and the higher degree of difficulty as the team's primary scorer. He has a quick release and a high release point, allowing him to get off of his shot without needing much space, whether spotting up or running off screens. He also does a nice job utilizing shot-fakes on close-outs and is able to put the ball on the floor for a few dribbles in either direction to set himself up for pull-up jumpers. He's struggled with his jump shot off the dribble this season, however, connecting on only 31% of his attempts, which has led to a mediocre 53% true shooting percentage, the lowest of his career. Some of this may be attributed to getting back to full strength on his knee, as he appears to lack lift when pulling up. In addition to his outside shooting, Hummel also possesses an excellent feel for the game and a very good overall skill level for a player his size. His lack of explosiveness limits his ability to make plays off the bounce, but he's comfortable handling the ball anywhere on the floor, and he shows good vision and passing instincts. An appealing trait to NBA teams will likely be Hummel's willingness to accept his limitations and play within the flow of the team concept. Despite the heavy load that he carries offensively for the Boilermakers, he rarely forces the issue, as evidenced by the fact that he's turned the ball over on only 7% of his possessions thus far, leading all forward prospects in our database. As we've mentioned before, Hummel's biggest question marks as an NBA prospect may come on the defensive end, as he lacks the prototypical athleticism to defend at the NBA level. At this point, Hummel's best chance for success defensively may be playing as a power forward. He doesn't have near the footspeed or lateral quickness to defend NBA small forwards on the perimeter, and while he may still be undersized at 6-8, his added strength would help him against some of the bigger players he'd face on a regular basis. To help make up for his physical limitations, Hummel shows a very good understanding of positioning and communication, having played for one of the top defensive programs in the NCAA over his last five years. He also plays extremely hard, displaying great toughness and energy. As a below average rebounder as a power forward, he'll need to fight hard on every possession to compete, something that will always likely be considered a shortcoming considering his physical limitations. A full healthy season may be as important as anything for Hummel as teams will surely have concerns over his chronic injury history (back issues as a sophomore and two torn ACL's). His health issues and lack of physical tools will make landing in the first round a long shot, but if he can prove to be a dependable perimeter shooter, his excellent intangibles and willingness to fill a role should earn him some looks from NBA teams as they look to fill out their final roster spots. 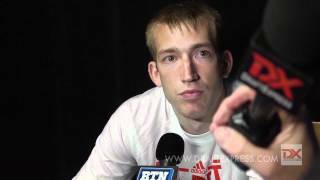 Perhaps no player will enter the Big Ten season with more questions surrounding him than Robbie Hummel. After a dynamic freshman season that saw the combo-forward emerge as one of the best shooters in college basketball, the Indiana native entered his sophomore campaign as the preseason odds on favorite to bring home Big Ten Player of the Year honors. Of course, we all know how the year played out. Hummel had respectable numbers, but didn't come close to living up to the early season hype as a result of playing the majority of the season with a mild stress fracture in the L-5 vertebrae in his lower back. He only missed five games, but the combination of pain and playing with a back brace certainly took its toll on Hummel as the season progressed. So the two big questions entering this season will center on the status of his back both in the short and long term as well as whether or not we can expect more performances like the freshman year two seasons back. Hummel's physical makeup has already been discussed several times on this site, earning him points because of his size for the small forward position, but leaving something to be desired with his average at best athleticism. What the junior lacks in physical ability he makes up for with toughness, smarts and craftiness on the offensive end. The forward's game was and still is built around operating on the perimeter, despite the fact that he sees significant playing time at the power forward position. Just over half of his field goal attempts in fact came from beyond the arc. For a player like Hummel it shouldn't come as a surprise that the majority of his touches result in him catching and shooting rather than attacking the basket off the dribble. He has a smooth, quick release, but as was the case during his freshman season, he often shoots the ball off balance, something that became more pronounced as he struggled with his back. Any hopes that Hummel has of landing in the NBA may hinge on his ability to shoot the lights out from beyond the arc as he did during his freshman season  his 38.1 percent clip last year certainly won't impress scouts nearly as much as the 45% he shot as a sophomore. As versatile of a player as Hummel is, his threat as a scorer starts to diminish when he puts the ball on the floor. He possesses good handles and is crafty enough to break defenders down, but he lacks strength and a great first step, and doesn't elevate particularly well. Many of the forward's driving attempts in the lane often look awkward as a result of his average leaping ability and poor strength. Still, Hummel converts at a pretty good rate when on the move because he has such a good grasp of how to move with and without the basketball. He rarely stands still when he doesn't have the ball, often looking for open spots and lanes on the floor. While he may not be able to beat many defenders off the dribble, he knows how to set himself up to get the ball in a situation where he will have an angle on his opponent. The same advanced understanding extends to how he runs the break for the Boilermakers. Hummel runs the floor almost like a quarterback watches a defense breakdown over the line of scrimmage. The forward will often times trail a play, watch how the lanes shape up and then attack an open seam for an easy look from one of his teammates. Hummel sports a near-2 to 1 assist to turnover ratio, which is almost unheard of for a college power forward. Defense still continues to be a major concern for Hummel. His 208-pound frame is still too thin to handle covering players in the post and he doesn't have the lateral quickness to cover smaller perimeter players. From an NBA standpoint he is very much a tweener at this end of the floor and that could certainly work against him. He does show good instincts, which allows him to intercept a fair number of passes and even come up with the occasional block, but that alone will not make up for his physical shortcomings here. He is an excellent rebounder, though, averaging nearly 10 boards per-40 minutes pace adjusted last season, an excellent rate. This season will tell us a lot about the future for Hummel as far as the NBA is concerned. If his back is completely healed and he returns to the same form he was in as a freshman, we're looking at a player who at the very least will get strong looks from the NBA. There are plenty of individuals in the League who do nothing more than shoot well from the perimeter; Hummel does plenty more than that. He can score off the dribble, albeit he doesn't excel here, he is tough, smart and can pass exceptionally well for a bigger forward. If he continues to have issues with his back though and perform as inconsistently as he did the final two and a half months of last season, the NBA may be nothing more than a pipe dream for the Purdue star.